As I have just started to surf the net it was interesting to find the PWSTS site. The first article I read was by Lucille Lucas and I was very interested in this as one of the photographs she has I also have as I am one of the lads shown. (I am directly behind the lad 2nd from the right on the front row). 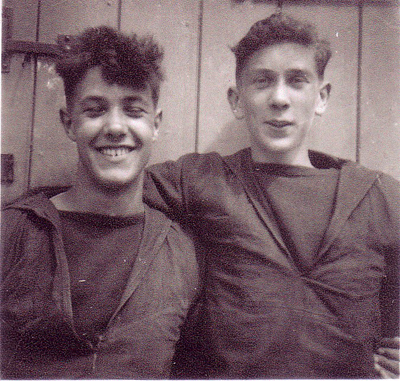 I also have a photo of David Amor also one of the lads who left the school the same time as me and we went to sea on the 'MV Delphic'. I have fond memories of our trips to Yarmouth pictures on a Saturday afternoon and our walks to Sea Palling on Sunday where if we had any of our 5/- left from Saturday we would visit the tea shop run by one of the instructors wives where we would enjoy a cuppa and a cake. I was at the school from early 1952 for approx 5 months and it would be interesting to contact anyone who was training at the same time as me.